Who invented Matches? The name of the person credited with inventing first successful friction matches is John Walker (1781 - 1859). John Walker is not only famous as the English inventor of matches but also as a Pharmacist and businessman. When were Matches invented? John Walker invented matches in 1826, during the Industrial Revolution period of invention (1700 - 1860). Definition of Matches: Matches are defined as a long, narrow piece of wood (matchstick) that is coated on one end with a compound that ignites when scratched against a rough or chemically treated surface. 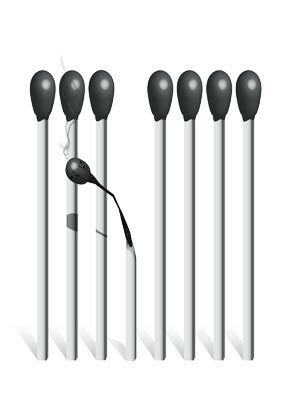 A match consists of three basic parts consisting of the head which initiates combustion, a tinder substance to pick up and transmit the flame and a 'handle' to hold the match. Fact 1: Who invented Matches? Friction matches were invented by John Walker in 1826 during the Industrial Revolution era of inventions (1700 - 1860). Fact 3: Who invented Matches? Prior to the invention of matches man used various methods to create fire. Stone Age man found that they could make fire by striking two hard pieces of stone together, which produced a spark caught on tinder and blown to a flame. Fact 4: Who invented Matches? Another method of making fire was by friction, rubbing two pieces of wood together. Rubbing two pieces of wood together producing a whirling movement and pressure created a spark that was caught on tinder and blown to a flame. Fact 5: Who invented Matches? As time passed more sophisticated inventions were employed to produce fire involving the use of a bow drill, hand drill, fire saw and pump action drill. Fire strikers, consisting of a piece of carbon steel which were struck by the sharp edge of flint or chert creating sparks, were then used and these implements were kept in a metal tinderbox. Fact 6: Who invented Matches? Tinderboxes were in common use during the 18th and early 19th century until they were made obsolete with the invention of friction matches. Fact 7: Who invented Matches? The inventor of matches, John Walker, was born on 29 May 1781 in Stockton-on-Tees, County Durham, England and died on 1 May 1859. Fact 8: Who invented Matches? The early years of John Walker were spent in Stockton-on-Tees where he was raised by his family. His father, also called John Walker, was the owner of a grocers and wine merchants shop and his mother's name was Mary Peacock Walker. He had three siblings, Thomas, Jane and Mary Walker. John Walker was an intelligent lad and was educated at a local Grammar School. Fact 9: Who invented Matches? Following his education his first job was as an apprentice to an eminent surgeon called Watson Alcock. John Walker worked as Watson Alcock's assistant but was pretty useless at his job because he could not stand the sight of blood. Fact 10: Who invented Matches? John Walker decided to change his job to that of a pharmacist and trained as a chemist and druggist. Fact 11: Who invented Matches? In 1819, at the age of 38 years old, John Walker opened a shop in hometown as a "chymist and druggist" at 59 High Street, Stockton. Fact 12: Who invented Matches? There was a workshop at the back of his shop and John Walker began to experiment with ways to find a means of obtaining fire easily, cheaply and instantly. Fact 13: Who invented Matches? Other chemists and physicist had also experimented with different chemicals which ultimately led to the invention of matches. In 1669, phosphorous was discovered by a chemist called Hennig Brandt but did not pursue ways of utilizing phosphorous. Fact 14: Who invented Matches? In 1680 British physicist Robert Boyle synthesised phosphorous and coated coarse paper in the substance. He then coated a splinter of wood with sulphur. When the wood was drawn through the phosphorous coated folded paper, it burst into flames. However, due to the scarcity of phosphorous, his discovery was too expensive to pursue. Fact 15: Who invented Matches? In 1805 French chemist Jean Chancel experimented in producing chemical matches by dipping a wooden splint in a mixture of sugar, potassium chlorate, and sulphuric acid. His experiment resulted in a dangerous explosion and gave off a foul, poisonous odour. Fact 16: Who invented Matches? John Walker knew of all the previous experiments but was convinced that the right mixture of chemicals could produce a stick for lighting fire. His breakthrough came in 1926 and as with many inventions it happened due to an accident. Fact 17: Who invented Matches? John Walker was experimenting with a combustible paste consisting of a mixture of antimony sulfide, potassium chlorate, gum, and starch. He stirred his mixture with a wooden stick. He later needed his wooden stick to stir another mixture but noticed that the paste had dried on the end. Bending down he scraped the stick on the stone floor of the lab to remove the paste and the the stick immediately burst into flames. John Walker had invented the friction match. Fact 18: Who invented Matches? John Walker did not patent his "Friction Lights" as he called the matches. John Walker's first friction matches were made of cardboard but he soon began to use wooden sticks, cut by hand. Later he packaged the matches in a cardboard box equipped with a piece of sandpaper for striking. His first sale of the "Friction Lights" was on April 7, 1827, to Stockton solicitor called Mr. Hixon. Fact 19: Who invented Matches? However, the "Friction Lights" did not sell well due to a bad manufacture fault. The flaming head of the match tended to separate from the 'handle', falling to the floor and ruining carpets and dresses. Fact 20: Who invented Matches? Because John Walker did not patent his invention other people benefited from his idea. A London chemist called Samuel Jones saw John Walker's "Friction Lights" and decided to market them in 1829, calling his matches "Lucifer". Samuel Jones' Lucifers cornered the market at the time and John Walker stopped making matches in 1831. Fact 21: Who invented Matches? In 1830 the French inventor Charles Sauria substituted the antimony sulfide with white phosphorus and these quickly replaced the Lucifers. Fact 23: Who invented Safety Matches? Johan Edvard Lundstrom's safety matches used red phosphorus that was placed on the striking surface, not on the match itself. They were called 'safety matches' because they would only ignite on the striking surface on the box and nowhere else, unlike the strike-anywhere matches, but the matches were still poisonous. Fact 24: Who invented Matches? John Walker died on 1 May 1859. He never made much money from his important invention. Fact 25: Who invented Matches? In 1910, the Diamond Match Company patented the first non-poisonous friction matches in the United States, which used a safer chemical called sesquisulfide of phosphorus that did not pose the health hazards of white phosphorus.